Boozhoo miinawaa akina-awiiya, biindigen! Hello again everybody, welcome to my blog! 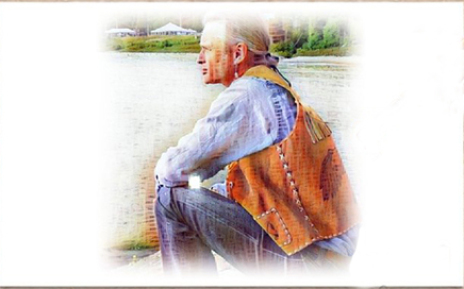 For those of you who are here for the first time: I am Zhaawano Giizhik and this blog story is the nineteenth already in a series titled Teachings Of The Eagle Feather, featuring my art (jewelry, mostly) along with works of art by kindred artists. Both my stories and the artworks displayed seek to provide an insight into the old and venerable worldview of the Anishinaabe Peoples. Today's story is an Ojibwe Teaching that I wove around a set of wedding rings, designed and handcrafted by myself, an iconic acrylic painting by Nakawe-Ojibwe artist Simone McLeod, and a pen-and-ink drawing that I made quite a few years ago. 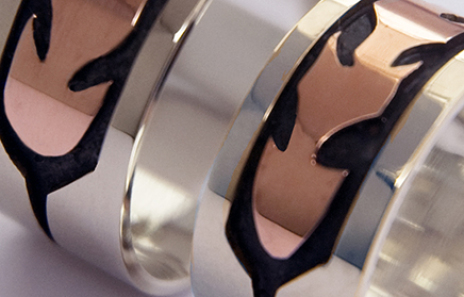 Let me first tell you a little bit about the wedding rings. 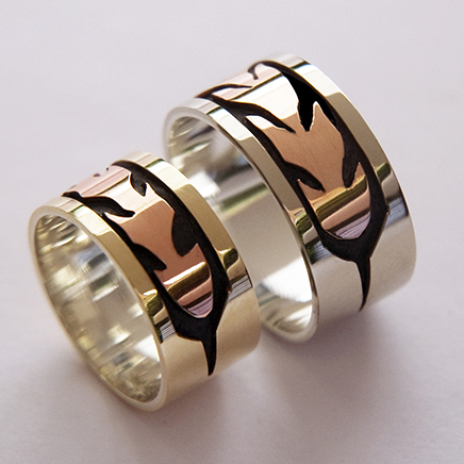 The 0.394 inch wide rings, which I constructed by hand with the aid of the, what I like to call, graphic overlay technique, consist of sterling silver; the eagle feather inlays, their stylized shape inspired by flame designs, are 14K red gold. The rings show oxidized, or sulphured, recesses of sterling silver, which creates a dramatic contrast with the red gold inlays. The wedding rings with the flaming eagle feathers symbolize the journey of two, as is called in the Ojibwe language, wiijiiwaaganag (companions on the Path of Life) sharing mino misko manidoo-miikana, the good red spiritual road. The feathers of the eagle and the spiritual road that they symbolize are in turn metaphors for what he Ojibweg call mino-bimaadiziwin, a way of life where being faithful to one’s origin and the well-being of one’s People and community are central, and where respect for oneself, each other, and one’s relatives and loved ones - but also for the larger world of all living things - is vital. In following mino-bimaadiziwin the Seven Instructions (often called “Grandfathers”) that have been passed on generation to generation can serve as guiding principles along the road. - The principle of mino-bimaadiziwin: how to live a good and upright life. Besides reflecting the straight spiritual journey through life that two life partners share in faithfulness and mutual respect, the flaming eagle feather designs of the rings tell the story of a more than thousand years old prophecy that led to the legendary odyssey of the Ojibwe Anishinaabeg. This legendary migration path of the People, who in a distant past lived along the northern shores of the Atlantic and at some point in history had been advised by Seven Grandfathers (prophets) - who were instructed by six Mystery Beings who had appeared from the ocean to teach the Grandfathers about the Mide way of life - to leave their home country and expand westward, would be marked by Seven Fires. To this day, the - possibly 2000 to 2500 years lasting- migration of the Anishinaabeg is known as niizhwaaso-ishkoden niigaanaajimowin, the Prophecy of the Seven Fires. The Prophecy of the Seven Fires, a sacred as well as educative teaching that has been passed on for thousands of years by many generations of Mide practitioners (members of the Midewiwin society), not only refers to the westward migration of the Anishinaabe People, but also, more particularly, to certain phases or eras in the history of the original peoples of Turtle Island (North America). – Part of the 7 Fires Prophecy predicting that in the time of the 7th Fire a New People will emerge who will ask their Elders to help them guide them into finding back the Good Red Road. Source: "Journey of Our People." Thus, the Good Red Spiritual Life Road that two wiijiiwaganag walk together against the background of the above-described Midewiwin teachings are graphically represented by the red flames that make up the rings’ eagle feather inlays. As I was designing the rings I wanted the seven flames to symbolize the historical journey of my People – and, viewed in a broader context, the Life Fire that burns in all human beings; the eagle feather itself denotes the spiritual, sacred nature of, what my ancestors called minwenindiwin: courtship, and wiidigendiwin: the companionship that exists between two life partners – which they considered the strongest of bonds. Giiwenh. That's how far the story goes. Giga-waabamin wayiiba, I hope to see you again soon. Aambe mino bimaadizidaa! Let's live well! Migwechiwendandaa akina gegoo ahaw! Let's be thankful for everything! Above lllustration: Zhaawenindiwag, pen-and-ink drawing @2015 Zhaawano Giizhik. 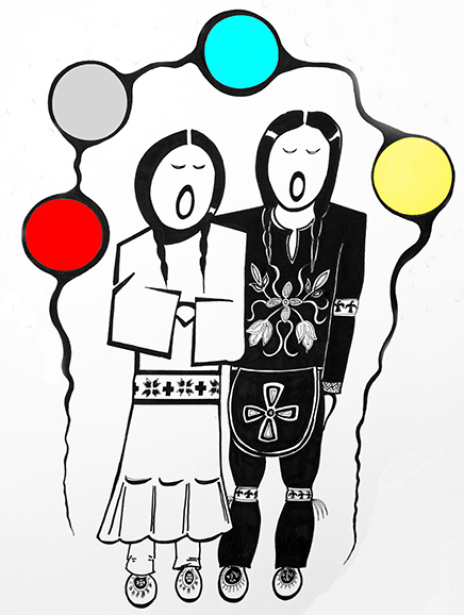 The drawing reflects the sacredness of wiidigendiwin, or partnership. "Zhaawenindiwag" is an Ojibwe word meaning: they bless, pity each other; they have mercy, compassion for each other; they show loving-kindness, unconditional love for each other.